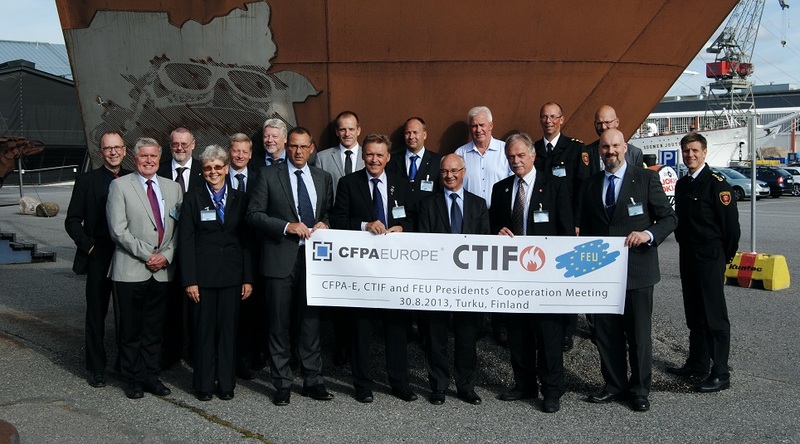 The Finnish National CTIF Committee was honoured to host meeting of the President of CFPA Europe, Mr. Jesper Ditlev, President of CTIF, Mr. Tore Eriksson and President of FEU, Dr. Dieter Nuessler in connection with the Fire Brigade in Finland 175 Jubilee on 30th August, 2013 in Turku, Finland. The aim of the meeting was to discuss on the principals of the further development of co-operation of the three organisations in enhancing European Citizens Safety and Security. Meeting was hosted and chaired by the Finnish National CTIF Committee, Chairman Mr. Pentti Partanen, Director General of the Rescue Services, Ministry of the Interior.